We hope these ready-to-print free materials will be helpful for hosting Conversation Cafés! A wonderful little CC wallet cards (folded business cards you hand out to participants) summarize the Conversation Café process and agreements. They’re a must-have! Use the host checklist to help you plan your event and to assure its success. The flyers and handbills will help to promote your event. Post the Café Meets Here poster to announce your café. 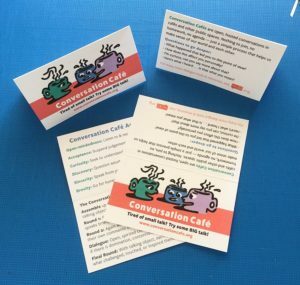 You can also print out small table cards that explain the Conversation Café process and list the Agreements, as an alternative or addition to the wallet cards. Some of these documents are available in other languages. Please feel free to translate any of these documents into other languages and email them to us for posting. We’d be happy to add logos to them. For your enjoyment, we have included a collection of insightful quotes on dialogue and conversation. Inspired by Leslie Schneider’s article about hosting a Conversation Café for a 7th grade Sunday School, the Conversation Cafe team has developed a guide for using Conversation Café with youth. Our adaptation uses Leslie’s innovative idea of giving each participant a specific role to perform during the course of the conversation. Click on these titles for three handouts that explain this process: Convener’s Directions, The Roles, Process & Agreements.